The new strain spreads more easily than usual from one country to another. (Bloomberg) — The death toll from the worst Ebola outbreak in seven years climbed to 80 in Guinea as the aid organization Doctors Without Borders said the disease’s geographical spread marks the flare-up as unprecedented. In neighboring Liberia, one of two confirmed cases has died, while a second person who died with a suspected Ebola infection tested negative for the virus, the World Health Organization said in a statement. 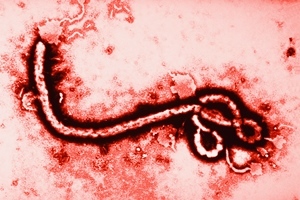 Both confirmed cases in Liberia were exposed to Ebola in Guinea, Gregory Hartl, a WHO spokesman, said on Twitter. The outbreak is the first in Guinea, which has 122 suspected or confirmed cases, the WHO said yesterday. The pattern of infection, with patients found in the coastal capital of Conakry as well as villages in the country’s southern area, marks this outbreak as different, according to Mariano Lugli of Doctors Without Borders. Guinea’s government has asked people not to eat monkeys, chimpanzees and bats and to avoid travel in the affected areas, while Senegal closed its southern border with Guinea. The WHO said it doesn’t recommend any restrictions on travel to or trade with Liberia or Guinea. No cases have been reported in Sierra Leone, which shares borders with Guinea and Liberia near the worst affected area. The Economic Community of West African States expressed “deep concern” over the outbreak and asked for international help in combating the “serious threat” to regional security. The Guinean towns of Gueckedou and Macenta, near the border with Liberia, have been hardest hit, with 55 and 14 deaths respectively, according to the nation’s health ministry. There are 11 confirmed cases in the capital Conakry, and three deaths, Tarik Jasarevic, a WHO spokesman, said yesterday by phone from Guinea. The WHO has distributed single-use protection equipment and hygiene kits to health-care workers in hospitals in an effort to stem the spread of Ebola, Jasarevic said. The virus, first identified in 1976 near the Ebola River in what is now the Democratic Republic of the Congo, is transmitted to people through the blood and other secretions of wild animals such as chimpanzees, gorillas, bats and porcupines, according to the WHO. Humans transmit the virus to each other through contact with blood and other body fluids. All the outbreaks of the past decade have been in Congo, the neighboring country of the Republic of Congo, and Uganda, with the exception of one in Sudan in 2004. There are no drugs or vaccines approved to treat or prevent Ebola. –With assistance from John Simpson in Toronto.